Lensbaby announced a new lens in their line of "fun" lenses. 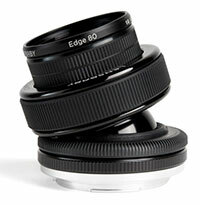 The Edge 80 Optic is an 80mm f/2.8 lens to be used in their special flexible lens mounts (available for Canon, Nikon, Sony, Pentax, and Olympus 4/3 SLR cameras). When tilted, it delivers a "slice" of sharp focus through the image, bordered by a soft blur just like a tilt lens; ideal for any situation where you like a selective focus – from food photography to giving scenes a “miniature” appearance. Without the tilt, the Edge 80 can be used just like any high-quality lens where the focal length of 80mm could be ideal for portraits. Canon's new 500 and 600mm teles to ship in May? Welcome to Hayo Baan's Photography Blog!